…or hairy wimps, we can be passive or active about this… I don’t care whose voice we use. I was bullied into this purchase by the good folks on Twitter who told me that if I didn’t buy one, my first born would hate me forever. Always open to a bit of parenting guilt, I went for the black. If in doubt, always buy something in black I say! It arrived a few days later, looking all sleek and shiny and I couldn’t wait to put it to the test. Now, to be fair… I don’t have particularly tangly hair. Nowadays it’s a lot finer that it used to be and I don’t have to do that whole “clench it at the roots” thing to reduce pulling and pain. My first impressions of the Tangle Teezer are that it’s a lot lighter than I anticipated and to be blunt, it’s a lot ‘cheaper’ feeling too. I’m used to paying out for a Mason Pearson and was hoping that this would be the brush that would help extend the last bit of life left in mine. 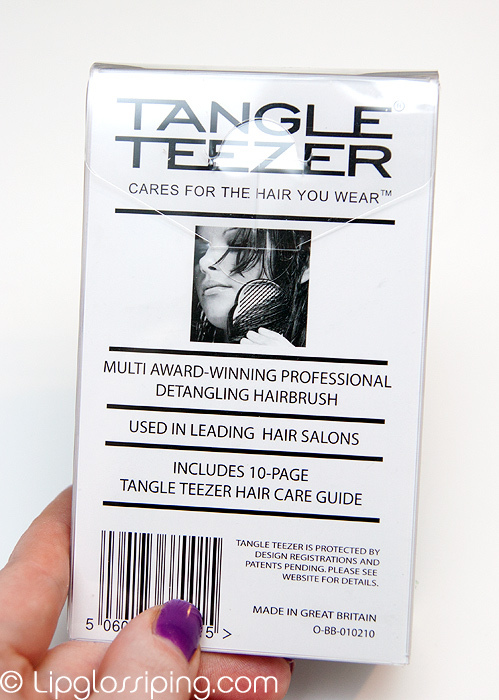 In other words, I wanted the Tangle Teezer to be my workhorse… and the Mason Pearson to be my finisher! The Tangle Teezer feels quite rough around the edges… construction is fully plastic and it is literally quite ‘rough around the edges’ with bits of plastic that catch on your skin. On a more positive note, Mr. L has told me in no uncertain terms that if I can’t find it, it’s because he’s stolen it to scratch his head with which means that my MP is off the hook. 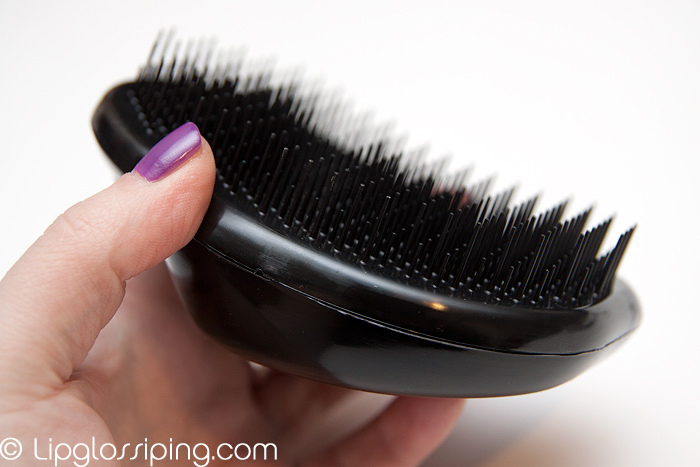 Anyone who owns a Tangle Teezer will understand what I mean when I say that the plastic bristles (I know that’s an oxymoron) really reach through your hair and give your scalp a great ‘brush’. Another problem I have with the Tangle Teezer is it’s tendency to fly out of my hand mid brush… this thing needs rubber grips on the handle like I need an Apple Martini… i.e. now. I would imagine that if your hair is thicker, this would be even more of an issue because of the additional pressure one would have to apply to draw the brush through the hair. It fits nicely in the palm, even in my small hands though it would be far too cumbersome for a child to hold. I believe they have a flowerpot designed Tangle Teezer especially for small hands! It does exactly what it’s supposed to, I can’t fault it on it’s detangling abilities on my fine hair. The teeth work through my hair like a hot knife through butter. But having said this, I still think it’s over-rated and overpriced. It feels cheap (but isn’t) and it’s quite poorly designed. I can’t even carry it around in my bag because the prongs look like they would bend out of shape if I blew on them too hard… but perhaps their flexibility is part of the reason it detangles so painlessly? Would I purchase it again? No… but that doesn’t mean I regret my purchase either. The Tangle Teezer is priced at around £10 and available online and instore at Boots. Just to add another experience to yours, I’ve got really bushy, shoulder length super curly hair, and I very rarely put a brush anywhere near it! I always detangle in the shower, with a wide-tooth comb, and leave it at that. On a weekend away, I forgot my comb, and a friend lent me her TT brush. First reaction was to laugh…no way was that making it through my hair! But it did! Even when the hair was dry. Sure, it created the world’s biggest frizz ball, but it did detangle, and it didn’t cause any damage. Not sure I’d buy one, my wide-tooth in the shower is really all I need, but if you really struggle with thick, unruly hair, then this really isn’t that bad a choice. I think it actually works better for thicker, more knotted hair! The shorter prongs mean that you can’t pull on all the hair at once, you are forced to deal with it in layers, and this makes the job much less painful. If I have kids, and they end up with the same hair as me, I’d definitely get one… God I remember the tears when combing through when I was little! I think your right, its not the best looking brush, feels cheap and does have a tendancy to shoot across the room if your not careful……buuuuttt it detangles wonderfully, and thats the point right? Ah ha ha, your Mr uses your Mason to scratch his head? My darling boyfriend uses mine to scratch his back…do they have no respect??!! You’re right about the construction – would love for it to have a decent grip and be a bit more ‘polished’ around the edges. But I’m still devoted to my TT. On thick, tangly hair it saves so much time. What I would have done for one of these when I was little, squealing as my mother combed my hair! Once you get used to the scary noise it makes on wet hair, it’s brilliant for post-shower detangling. I used to have to work away with a wide-tooth comb for about ten mins when my hair was longer. With this I could do the same job in 2. It’s the only brush I take on holiday with me now. This brush is my hair lifesaver. I have super dry, frizzy and extremely tangly hair (which has always been this way – my poor mother had a daily screaming match trying to get a brush through my hair). I don’t put a brush to my hair other than in the shower with conditioner as half of it will break off – the TT makes what used to be a 15 min job at most a 3 min job – straight through my hair, wet or dry. I agree it’s not the most expensive looking brush, and might be overpriced – but I’d happily pay double or a replacement – honestly can’t live without it (and my mum is kicking herself this didnt exist 20 years ago)! These always looked like dog grooming brushes to me…I have thick hair but I’m also cack-handed and imagine I’d be dropping it all the time if it’s hard to keep hold of! This is a lifesaver for me also…I have very thick long hair (to the middle of my back) and it is the only brush that I can use to untangle my hair when it is wet out of the shower…it then dries all tangle free and lovely. To be fair though I hate it on my dry hair and use my usual brush…. but for untangling wet hair it really is a must have product. I bought one for my daughter’s unruly hair, since bathtime was such a nightmare. She loves hers, and it makes visiting “mummy hairdresser” so much mor pleasant for all of us. My balding dad bought one to use as a massage tool for his bonce, and another friend got one to detangle her dog’s hair! I’m terrible, and I only brush my curly hair when it’s wet, going against the first rule of beauty. I should be ashamed. 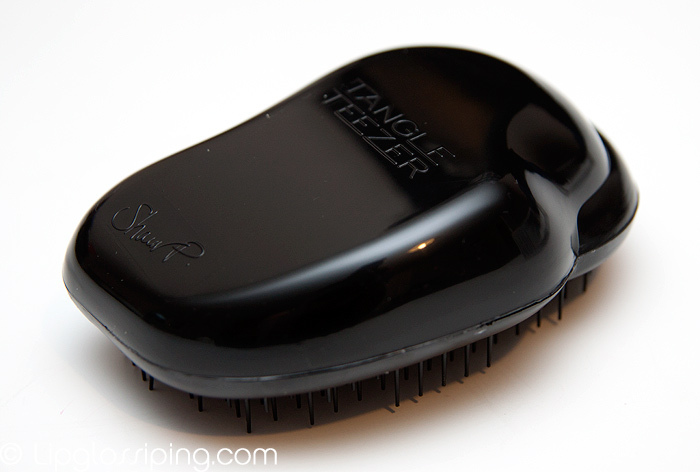 I’ve had the tangle teezer for nearly 3 years, I use it every day and I love it! I have really fine long hair and any other brush just really can’t untangle it the mornings. You’re dead right about it flying out of the hand mid brush stroke though- they should make one with grips on it definitely! This product is a lifesaver for me… My hair reaches halfway down my back and has a wave in it. I used to spend ages combing it out after washing, but with the TT is just glides through! I still stick to a brush when I’m styling, or on a normal morning, but for wet hair tangles this is amazing. I bought one of these and love it! However, it is, as you say, way overpriced! And no, I wouldn’t buy again either but nor do I regret buying it. I have this brush and i LOVE it!!! My hairdresser persuaded me to buy it – as my hair was WAY too prone to tangling! 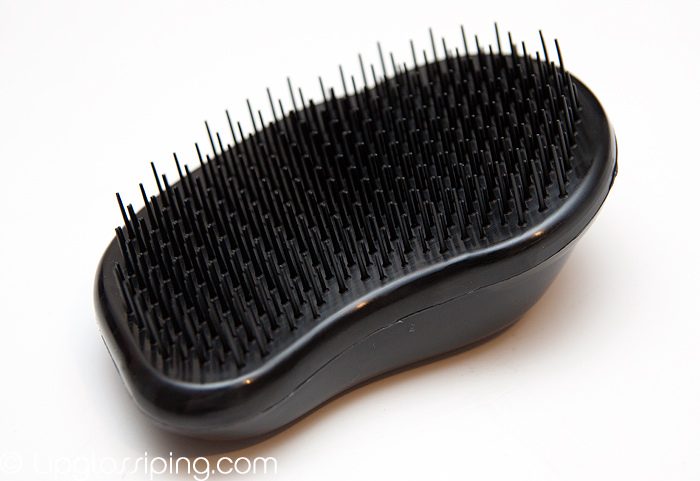 I wouldn’t go so far as to say my brush is a life saver, but it is very nice on my thick, wavy, tangly hair. I think I need something like this – my hair has become a complete struggle nowadays. But yeh, I always though it looked cheap, useful, yet overpriced. Like the PedEgg! I suspect it’s something that’s more useful for those of us with thick, wavy/curly tangly hair. I don’t brush my hair between washes, because I would turn into a massive frizzball if I did, but before I wash my hair my Tangle Teezer is the only thing that will work out the knots (which are worst at the back of my head) without causing me a lot of pain! Thank god I don’t have Western hair! I’ve never understood the whole ‘tangled after wash’, ‘frizzy when damp’ and ‘poodle’ things since I’ve never experienced it. Of course, my poker straight Chinese hair also doesn’t allow my to have the tousled beach wave look simply with salt spray and my curls drop out within the day when I use heat. The Tangle Teezer looks too much like a pet coat groomer, though the black colour does give it a thin veneer of sophistication. A very thin layer indeeed. I am so, so tempted to get the flowerpot one for my kiddies- anything to shut them up in the morning when it’s hair time!! I picked one up last night with my Boots points – it’s HOT PINK and so makes me feel like a teenybopper whilst using it, plus its shape means I can’t sing into it and pretend I am Beyonce so it loses cool points on those items…. As for my hair? I’ll have to see! Pity it’s so expensive/cheap feeling. I need something to detangle my insane curls. now i bought this for my daughter after my beloved “magic brush” (mason pearson) went walkies and i hate it. I have this but i’m not a lover of it at all. I have thick hair and the ‘bristles’ don’t reach through it, they kind of scrape over the top. This means i have to section my hair off and go over each section two or three times, sloooowly. I’m back to using a wide-toothed comb because this is just too much of a faff. ESPECIALLY on wet hair. May be my thick hair, but i don’t rate it. I have one too I love it:) It does look cheap but for my long wavy, tangly hair its amazing. I brought mine on sale at amazon for £3 but if i lost it I would pay full price to replace it. I have a travel tangleteaser, now granted it is in an unfortunate shade of Barbie pink, but there are several pluses. It is a wee bit smaller than the regular one and fits very nicely in the hand and it also has a cover that clips on so you can carry it around in your bag should you be the sort of girl that actually brushes your hair more than once a day. And gotta say, thank god for it; I have long fine highlighted hair and if not for this I would literally be tearing my hair out, and not just me either. They use them at Hari’s salon and after the kind of scalp pummelling hair knotting shampoo they give I would be afraid to let them use a comb. For me it’s worth every penny and I’m thinking of getting an extra one for the handbag should I decide to become more groomed! When my hair is long there is not a chance this would reach through it all- actually I think I would have to work in layers with a tangle teaser even with my current pixie crop! My hair is thick thick thick and this seems like an impractical choice for me. My boyfriend however has long hair and it’s very fine and curly… And tends to knot. Watching him brush it out is tortuous, my follicles sometimes experience sympathy pains*. So maybe this would be a good choice to get him to stop him pulling out so much of his hair when he brushes it?! *this results in me either a) brushing it for him or b) hiding behind a pillow crying “brush the knots out from the bottom! Start at the bottom and work up to the top” and him looking at me in confusion. I want one only because everyone says how great it is. I’m easily led I know but £10 seems so much for a little lump of plastic. Freebie Alert: STILA Lip Glaze in Kitten - It's a lipgloss amnesty! Which new L'Occitane Tempting Tin are YOU?